Coffee With Games: Dart Rage official Nintendo Channel data report! How many hours/years spent throwing darts? Dart Rage official Nintendo Channel data report! How many hours/years spent throwing darts? Do you enjoy playing darts? Well, U.S. Wii owners have apparently enjoyed playing virtual darts these last few years, in at least one game. Dart Rage released for the WiiWare service on March 1, 2010 in the U.S., at a $6.00 price point (600 Wii Points). The game was developed and published by JV Games, and received an ESRB rating of "EVERYONE" with "Alcohol Reference" listed as content for parents and gamers to be aware of. The description for the game on the Nintendo Channel reads, "Dart Rage puts you in the spot light as you compete against friends, the computer, or both. Dart Rage features pixel perfect accuracy and has 4 freat games to choose from including: 301-901, Cricket, Poker, & American darts. Change the game play with plenty of options like VS. Mode; where you compete at the same time in a race to the finish." About how many U.S. Wii owners have reported playing Dart Rage since it released, and what's at least one Nintendo published Wii retail game that Dart Rage has a higher reported average "Per person" than? Also, if you own a Wii U and have some extra Wii Remotes around, would this be a good virtual dart game to grab, based on the average reported "Per person"? Brew yourself a cup (or two) of coffee, and let's take a look! 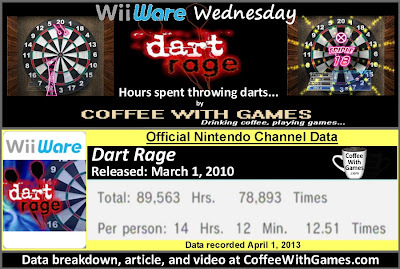 First, Dart Rage has approximately 6,306 U.S. Wii owners with gameplay data reported through the Nintendo Channel. The game has had almost 90,000 Total Hours of gameplay reported, that's over 10 years' worth of virtual dart playing, with 1,127 days possibly reported. The game has an average reported play-time of 14 Hours 12 Minutes, as you can see in the image above, which averages out to be 1 Hour 8 Minutes per time/day reported. 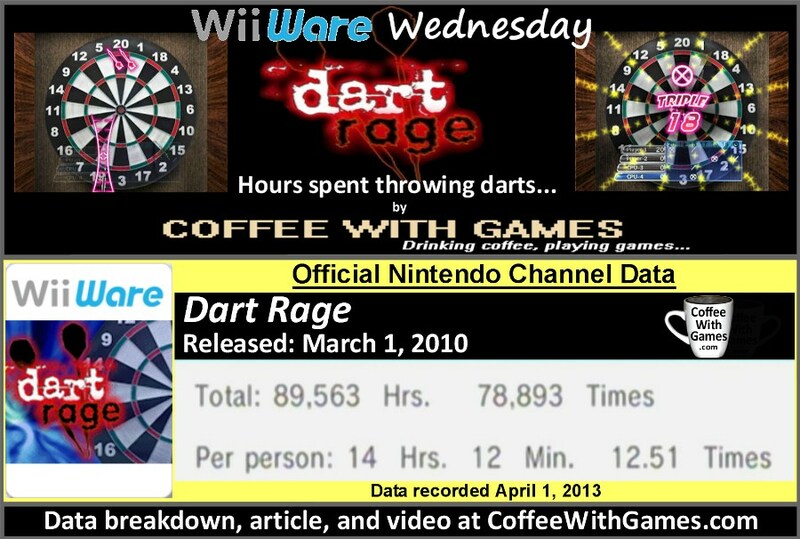 This means that U.S. Wii owners have played Dart Rage just over 1 hour each time they sit down to play. Like many other WiiWare titles, Dart Rage wasn't reviewed by many sites when it released, but the game has a "professional" review score average of 70.00%, based on just 2 reviews on GameRankings.com. Dart Rage's U.S. WiiWare release has made JV Games about $37,386 since it released (before taxes and profit sharing), just based on the approximate number of players with data reported and the game's $6 price point. Like the video, and subscribe to the YouTube Channel here! I was very surprised to see Dart Rage, again it's a WiiWare game, with a higher reported average "Per person" than several other WiiWare games I have reported on in the past. Not only does it have a higher average "Per person" than some other WiiWare titles, but it also has a higher average "Per person" than some retail Wii games. One of those being Sin & Punishment: Star Successor. Sin & Punishment: Star Successor was published by Nintendo and released for the Wii in 2010, just a few months after Dart Rage. The difference is that Sin & Punishment was a Wii retail release, meaning you could find it in stores, and it had a MRSP of $49.99. So, the reason I am surprised to see Dart Rage with such a high average "Per person", is that its average is beating out games that released at much higher prices, but apparently offer less replay value than a digital game that costs a fraction of what their "new" prices were when they first released. Do I think that Dart Rage would be a good virtual dart game to purchase, if you own a Wii or Wii U and are a fan of playing darts in general? I do, at least based on the average reported "Per person" through the Nintendo Channel. If you're interested in Dart Rage, you should know there is a free demo that you can download and try for the game, from the Wii's/Wii U's Shop Channel. Do any of you own Dart Rage, and if so, what do you think about the game? Is it a game you would recommend to Wii, or now Wii U, owners who enjoy darts, and might be wondering if a virtual dart game is worth it? Maybe you haven't played Dart Rage, but do any of you perhaps play darts in real life (not virtual!) on a regular basis? You can purchase Dart Rage from the Wii's/Wii U's Shop Channel using either a credit card or a Wii Points card (seen below). You can also purchase dart boards from Amazon.com below as well! Wow! Haven't thought about this game in a long time. A nice surprise to see this breakdown. Definitely recommend this game for anyone who's into darts. Miles better than the other WiiWare offering, Pub Darts. It's interesting you mentioned it, because I did check the other WiiWare "dart" games, and Dart Rage was the only one with data showing up on the Nintendo Channel. One other thing I found interesting, is that I didn't see one dart game that let the Wii MotionPlus accessory be an optional control method (might have missed it), but from this data it seems like people enjoyed the game enough without the WM+ even being needed. Of course! The control system used in this game is very accurate and responsive, to the point that I can't see WM+ making any difference whatsoever. That's what stuck out to me the most about the game. When you calculated how much money JV Games made for the release, did you take into account Nintendo's cut? It's kind of funny you asked that, because as I was typing this one out, I thought "Nah, I don't need to include the ()". I have included in the past, usually in (), "before taxes and profit sharing". I'll update this one with that text as well, just so it's a little more clear. But yeah, the WiiWare numbers I have heard vary from 5,000 to 6,000, before payout, and I would imagine that would be for world-wide releases (so, 5,000 to 6,000 for all regions? ), but it's not very clear. So, if this game was released in Europe and Japan (maybe in Europe, probably not in Japan with how publishing is there? ), then the amount would be more than is reflected here. And again, these numbers aren't 100% for sales, but are pretty much the only numbers we have for WiiWare titles. The majority of WiiWare developers either didn't, or can't, release sales numbers for their titles. Thanks for asking and the comment!